Ever had Chicago-style pizza? It’s deep dish, almost like a pie, with “toppings” usually found under the cheese and a crust along the edge that’s an inch or more high. And this kind of pizza isn’t that easy to find in Southern California. After reading that two friends in Pomona had recently relocated from Chicago, the New Diner blogger sent me a list of Chicago-style pizza parlors in the region. They’re in Riverside (Romano’s), Yucaipa (AJ Barile’s), Echo Park (Masa), Yorba Linda (PHAT) and Placentia (Tony’s). To mix my food metaphors, it’s as if the Inland Valley were the hole in the doughnut. It hasn’t always been thus. Rancho Cucamonga has had two outlets in the Numero Uno chain, and Upland used to have a mom and pop named Joe Chicago’s. You may know of others. The closest thing now is the BJ’s Restaurant and Brewhouse chain, with a location in Rancho Cucamonga near Ontario Mills, which serves deep-dish pizza. Other than that, nada. If you like New York pizza, which I happen to prefer, we have the excellent San Biagio’s in Upland, and there may be more; certainly it seems New York pizza is easier to get and better known around Southern California than Chicago pizza, its total opposite. Don’t a lot of Chicago-ites flee its frigid winters for balmy SoCal, yet crave a taste of home? Well, we tried the place the New Diner recommended the most highly, Tony’s Little Italy in Placentia, which as luck had it was also the closest, 16 miles from Pomona and a straight shot down the 57. We got a Tony’s special (sausage, mushrooms, onions, peppers), the 14-inch large ($22, I think). They have Chicago sports pennants, photos and other items on the walls for that Chicago touch, and of course you can watch Chicago teams play, and probably lose, on the TVs. You have to wait 30 minutes for a crust that thick to bake. But the pizza was very good, with the crust especially coming in for praise. It’s so rich and crunchy and buttery. Getting a large was a mistake, in a sense. Chicago pizza is so dense, we could eat only two slices apiece, or 1 1/2 each in my friends’ case. We split up the remaining half (!) to take to our respective homes. I jokingly suggested we simply cut around the rim, share the outer crust and leave the pizza. But of course we wanted the guts of it too. In the end the oversized pizza wasn’t really a mistake because the leftovers were great as well. 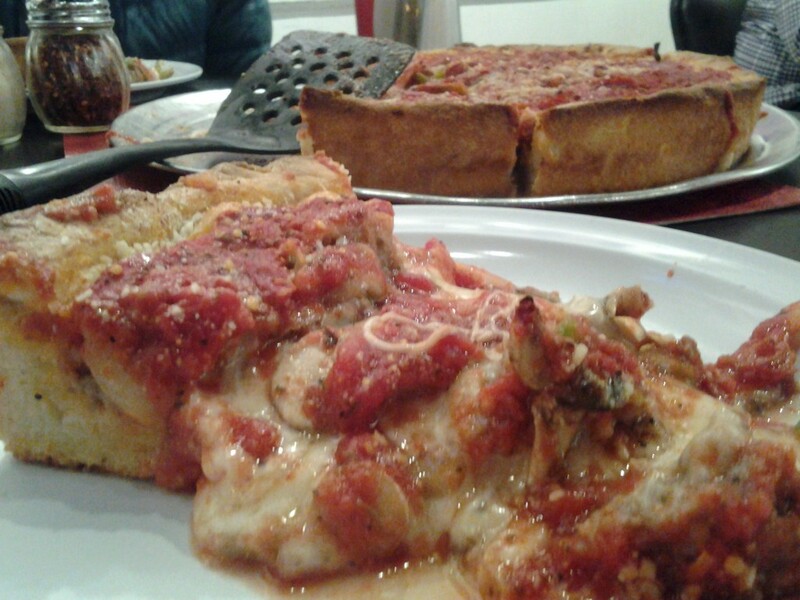 Have you had Chicago-style pizza, here or in Chicago, and if so, what did you think? Were that I had not been too poor to afford it more than, like, once while a student there, settling instead for Gumby’s and their 20-inch, which I think was 8 bucks. University of Illinois also had a Giordano’s, where I ate once or twice. Giordano’s! Best Pizza in the World. And I’m not even from Chicago (or Illinois). Chicago Pasta House Moreno Valley. 1) Every time I see the pizza box in our recycling, I have a Pavlovian response. 2) I love the font of the article. If you call ahead and let them know you’re eating there, your pizza will be ready without the wait and they’ll reserve a table for you in their tiny, little dining room. When I connect trains in Chicago for cross country trips I always try to get Chicago style pizza. It’s one of the highlights of any trip. 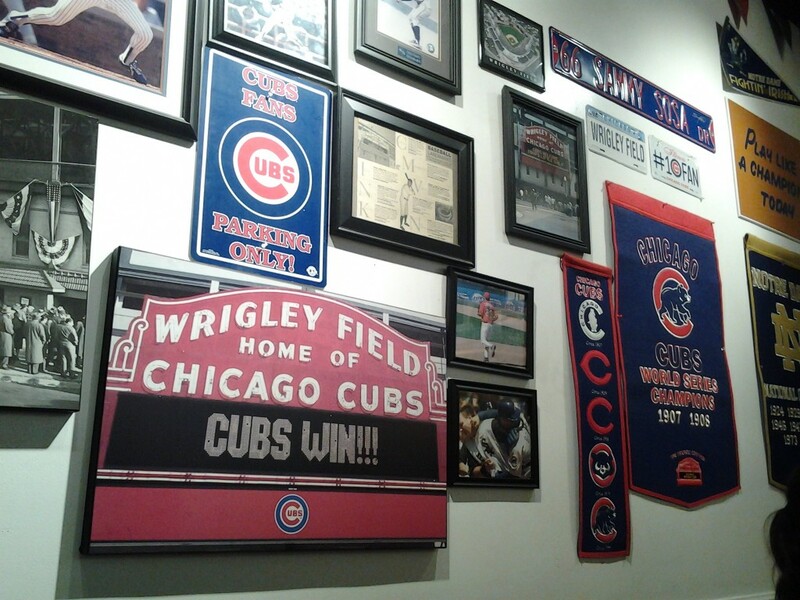 I’m partial to Lou Malnati’s myself, or Zachary’s pizza in the Bay Area. It’s sad that the Bay Area has better Chicago style pizza than LA, despite a much smaller population. SF had a prominent Italian-American community at one time. Without one, good Italian restaurants are rare. As far as New York Pizzerias go..try New York Pizzeria in Chino…worth the drive!! Been meaning to try it, so thanks for the encouragement! Try the best…Hollywood pies. They’re in Downtown LA, just google it. Paxti’s pizza in the S.F. bay area is the closes to the stuffed pizza similar to Edwardo’s of Chicago. Another unique pizza in the I.E. would be Carlo’s Italian Bakery Pizza http://www.eatatcarlos.com/ found in Montclair. I’ve been meaning to visit Carlo’s,.In fact I noticed them again this morning while passing by on Central and made a note of the name.